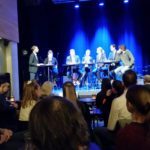 In the REGIMES project, we are applying many different methods to illuminate the question “What will future Norwegian regimes of the Arctic look like?” I have many impressions from the Arctic Frontiers 2017 conference in Tromsø related to this question. Since the REGIMES project has an overrepresentation of women (for good reasons…) I will take this opportunity to focus on three men that made impressions during the intense week in Tromsø. 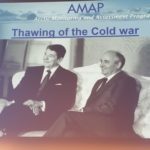 First, at the Welcome Reception, the “Thawing of the Cold War” was mentioned as a positive turning point for USA – USSR relations, also in regards to the research and political situation of Svalbard and other arctic areas. Research collaboration is of course essential to collect and synthesize data and observations for such a huge area as the Arctic. Mikail Gorbachev was influential in this period. In the 1980s the Soviet Union didn’t participate in a number of international discussions among scientists and Arctic policy makers. But it would fall to the Soviet leader, Mikhail Gorbachev, to highlight the importance of scientific collaboration in the Arctic on the global stage. “The community interrelationship of the interests of the entire world is felt in the northern part of the globe, the Arctic, perhaps more than anywhere else,” he said in a famous speech in Murmansk in October 1987 that marked a key moment in the Soviet Union’s opening to the West. Along with proposals related to nuclear and conventional security, Gorbachev called for an expansion of existing scientific collaborations under a proposed “Arctic Research Council” and offered Murmansk as the host city for such a meeting. And he called for “an integrated comprehensive plan for protecting the natural environment of the North.” The following March, twenty-five scientists from the Arctic countries met in Stockholm and created the International Arctic Science Committee, which has gone on to coordinate international Arctic research, for example, the influential Arctic Climate Impact Assessment in 2004. I found out later that Jensen’s boat is called “Castro” and he is a firm believer in strong socialist ideals like equal wealth distribution, which very much explains his exclamation to Minister Sandberg, who is a traditional market conservative from the “far” right party (Frp) in Norway. For me, this underscored the role of political attitudes and philosophy and how these play out in actual questions related to how fisheries are managed within Norway. Finally, at Arctic Frontiers I also had the opportunity to spend time with some of my colleagues from the Nordic Marine Think Tank www.nmtt.org, especially former Chairman of NMTT, Professor Sten Sverdrup-Jensen. Sten is a descendent of the famous Norwegian Oceanographer Harald Sverdrup as well as other influential Sverdrups including the captain of Fridjof Nansen‘s famous boat Fram, Otto Sverdrup. 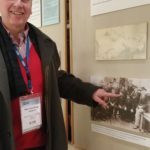 It was very fund to tour the Polar Museum at the gracious reception held there with his wife to relive some family memories, along with some photos of Otto that he was keen to find. This experience, along with Sten’s own anecdotes of his mother telling him and his brother to never become submarine sailors because of the terrible living conditions in the 1940s and 50s that she witnessed in Bergen, Norway, were a reminder of how polar exploration and marine science is really a living part of Norwegian history also today. These are just some of the many impressions I had experiencing my inaugural Arctic Frontiers. I was very impressed with especially the first 2 days with science and policy discussions with several prominent Nordic and European and Russian ministers and leaders. There is no doubt, the climate is getting WARMER and the politics and diplomacy issues are getting HOT! REGIMES will definitely have a presence at next year’s conference, so see you there! !